Wikipedia tell us: “The story was previously serialized in the pages of Ware’s comic book Acme Novelty Library, between 1995 and 2000 and previous to that, in the alternative Chicago weekly New City. I have a sheaf of Chris Ware’s Acme Novelty Library comics still lying in a plan chest here, collected in the late 90s when I still maintained some knowledge of what was going on in the worlds of comics. 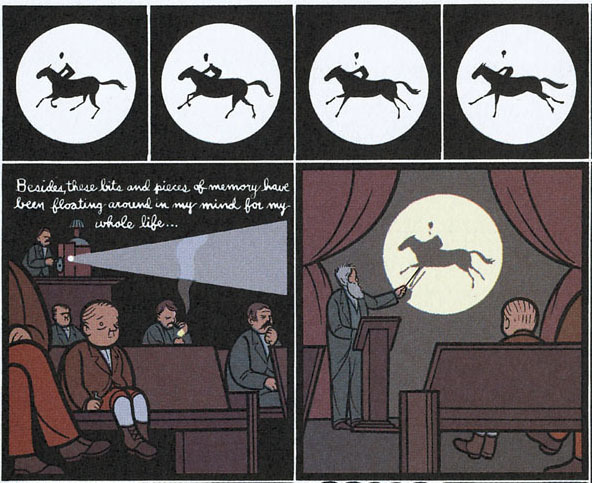 I was very keen on Jimmy Corrigan, but certainly didn’t see the Muybridge pages. 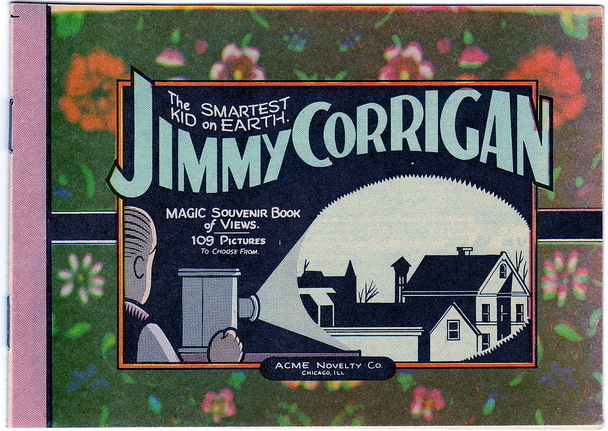 Another web site tells us: “Chris Ware was born in 1967 and his hugely popular Jimmy Corrigan was awarded The Guardian First Book Award in 2001. Although it originally appeared as a syndicated newspaper strip in London from 1993 to 1999, US author and artist Ware conceived it, from the outset, as a lengthy narrative. The work, published by Jonathan Cape, combines innovative comic book art, hand lettering and graphic design to tell the story of Jimmy Corrigan, a boy with the face of a disappointed old man, and his relationship with his absent father. 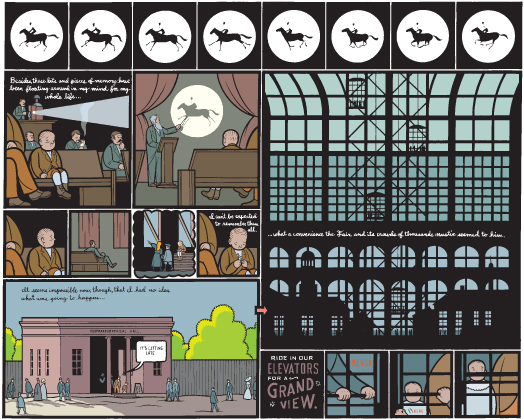 Chris Ware’s comics have included a cutout peepshow, zoetrope, flip book, and mutoscope. ‘GLOUCESTER LITERARY AND SCIENTIFIC ASSOCIATION. 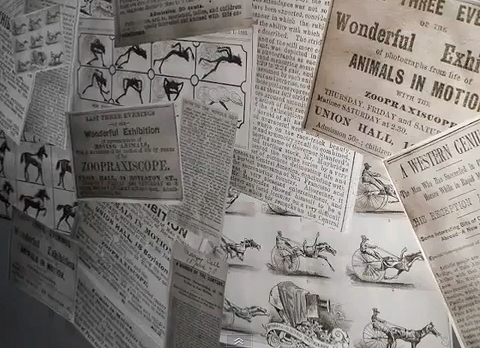 [last evening] … the Corn Exchange was crowded, the attraction being a lecture by Mr. Eadweard Muybridge on ‘The Science of Animal Locomotion in its Relation to Design in Art.’ … There followed a description of the lecture, and finally…. 27 January 1890, Lecture at Grantham. Your tardy blogger has finally been to see Degas and the Ballet. Picturing Movement, at the Royal Academy of Arts, London. A brief visit only, and I shall be returning for a more extensive tour – to learn more about Degas and enjoy his paintings, drawings and sculptures, and not just to admire the exhibits relating to chronophotography – before the show closes on 11 December. An unrepeatable opportunity to see all of these Degas works, so do try to get to the exhibition if you can. First impressions then. The catalogue, by Richard Kendall and Jill Devonyar is an attractive and engaging piece of research and presentation and great value (reduced to less than £15 at the time of my visit). Muybridge images used include the usual Zoopraxiscope colour photograph (with the top and chimney that don’t actually belong); the colour disc White and Black Running Race; a nice 1889 letter from Muybridge to Frederick A. Eaton of the RA, concerning Muybridge’s forthcoming lectures there; and a single image from ‘Annie G. in Canter’ (Animal Locomotion plate 621) together with an exact copy in chalk by Degas. Many images relating to Marey’s work are also included. 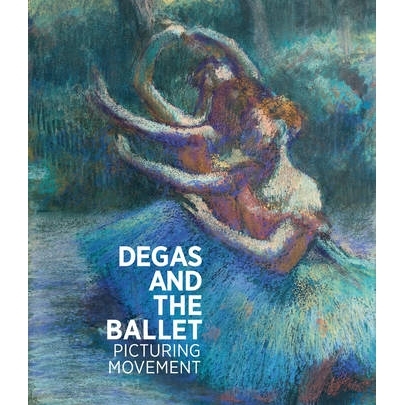 The text concerning the relationships between the work of Marey, Muybridge, and Degas is carefully researched and well written and very interesting to read; and of permanent value. The exhibition is spread through several rooms and wasn’t crowded during my visit. There’s a great deal of material concerning the relationship between Degas and photography in general, as well as chronophotography. 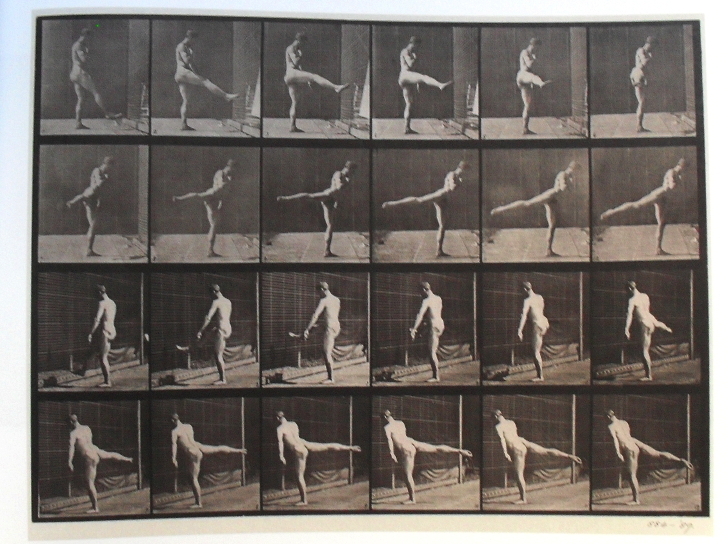 Most of the Muybridge material relates to aspects of dance postures. 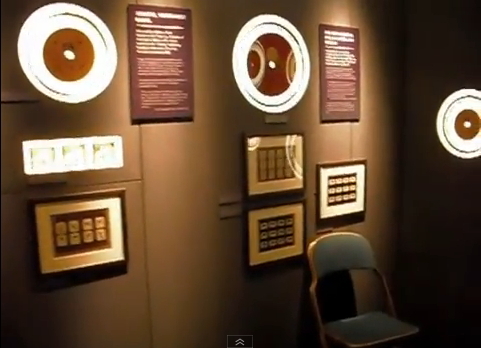 One of Marey’s large chrono plate cameras sits in a rather gloomy cabinet in one corner, failing to look interesting. 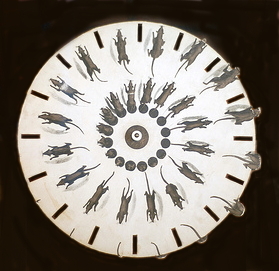 The Zoopraxiscope is better presented, but in a context that raises some questions. 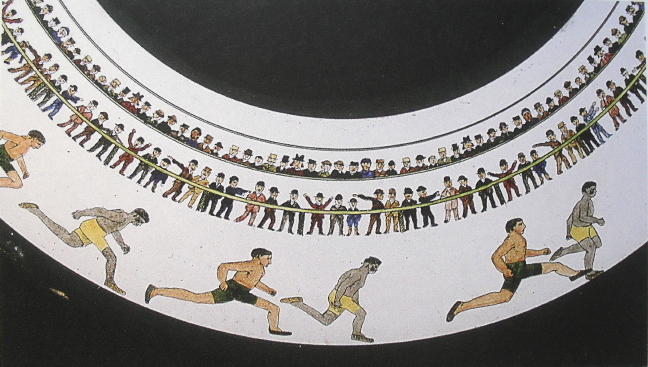 In the same cabinet is one picture disc, the 1893 Athletes Running (White and Black Running Race); two athletes, one white and one black, compete in a track race, with a large audience of matchstick figures in the background. 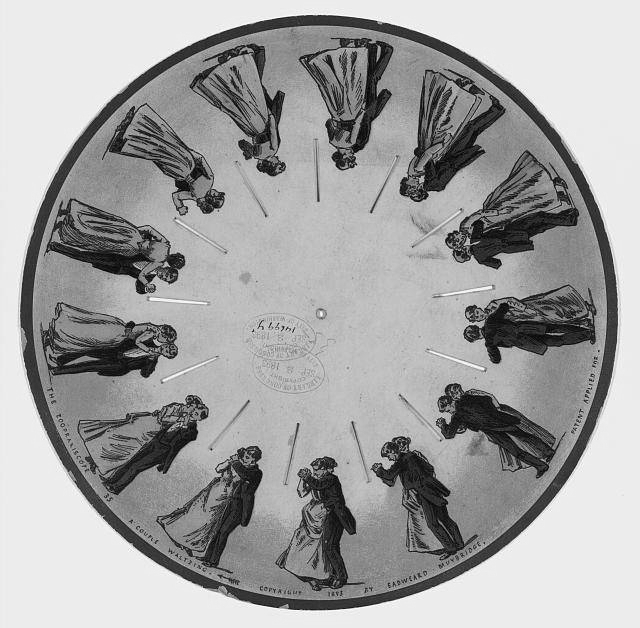 This disc is one of the series of drawings based on Muybridge photo sequences combined with imaginary elements – in this case the people watching the race. On the wall above the machine is a large video projection; an animation of a Muybridge sequence of a male athlete performing a ballet-related movement, taken from an Animal Locomotion reproduction of the actual photographic images. Judging from the overheard discussions of those examining this exhibit, visitors are understandably confused. The animation that they’re watching doesn’t appear to have anything in common with the images on the displayed picture disc. 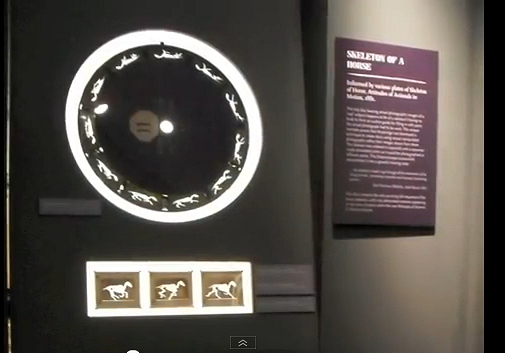 Of course it’s tempting to animate the Animal Locomotion sequences as the result is very seductive, but it seems to me that this particular exhibit should have had, instead, an accompanying video of a disc animation – perhaps the popular subject Woman Dancing [Kingston EM0052] which is probably the most relevant to the exhibition’s subject – to bring some point to the display of the Zoopraxiscope. The exhibition curators have missed an important trick here, since the animated disc images would have made apparent to the visitor a lesser-known aspect of Muybridge’s work that relates directly to drawing and painting, surely of interest in an exhibition about Degas and movement. The catalogue touches on the production methods of the actual disc pictures and gets it nearly right, so it’s difficult to understand how this misleading display option was decided upon. And since the name of the artist, Irwin Faber, who interpreted and drew these extrapolations from Muybridge sequences is known, that name should have been there too. It seems that there’s still some way to go before art historians apply their usually very meticulous discipline in presenting accounts of technical processes and artist attribution, to peripheral subjects such as Zoopraxography. But there was a certain satisfaction in seeing the Zoopraxiscope back at the RA, after almost 130 years. More on the exhibition, with less harping on about my own view of its very few shortcomings, soon. Muybridge’s Scrapbook, in which he amassed every trace he viewed as essential about his work, across a span of over thirty years, so that it accumulated into an extraordinary memory-book that interrogated and overspilled time and its own parameters. …. 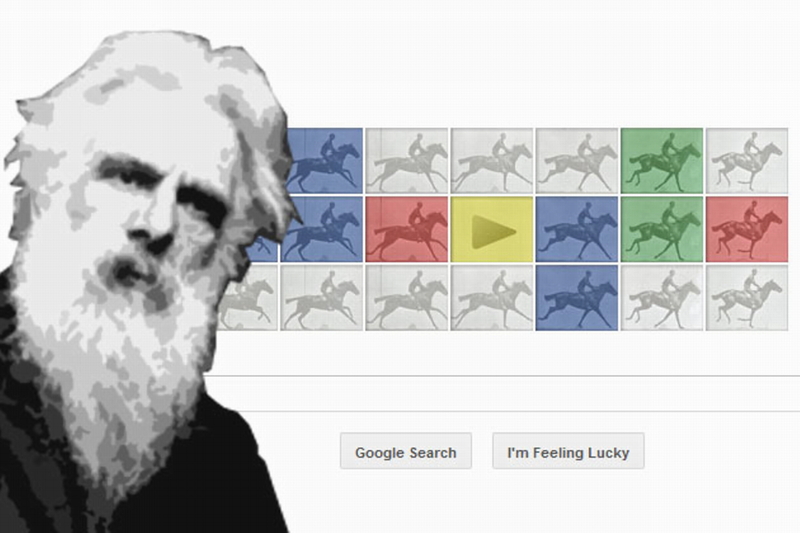 an aberrant vision-machine as well as a time-machine, and an irreducible archive in its own right, that holds revelations not only about Muybridge’s work, but also into the origins of film, the future of digital culture, and the perception of urban and corporeal forms. … interrogates that pivotal memory-document of Muybridge’s work – in many ways, a crucial document for the understanding of how contemporary visual cultures originated – by disassembling it into the fragments from which it was created, in order to probe the all-encompassing ocular and corporeal processes at stake in Muybridge’s work. Muybridge’s pervasive inspiration extends far beyond the domain of film and photography, encompassing visual art, poetry, performance, fiction, digital media, choreography, and theory. … the archival, preservational implications of Muybridge’s work and its own movement into the future, as a body of work whose contrary amalgam is fused by preoccupations with loss, speed, perception, projection, corporeality, vision and the ‘tactile’ eye. 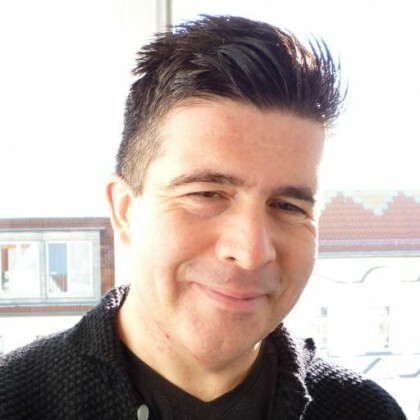 In many ways, those preoccupations are exactly those of contemporary digital culture, and connect with archival issues around the uniqueness and potential reproducibility of objects, through such processes as digitisation. While forming a seminal presence for contemporary culture, Muybridge’s work, in its non-replicating resistance to assimilation, also necessitates an archive of its own. In a parallel way, his Scrapbook, itself a self-archiving by Muybridge of his work’s fragmentary traces in texts and images, also demands the formulation of an archive consisting of one unique artefact, in the way that Jacques Derrida, in his final interviews, envisaged objects of such all-consuming resonance that they required a tangible separation and a distinct space of their own, in order more intensively to then impact upon and reveal the surrounding worlds, and their visual cultures; in that sense, no object deserves its ‘sacrosanct’ one-artefact archive more than Muybridge’s Scrapbook. Stephen Barber tackles much, much more in this new work – do read the Introduction, which is online now. Stephen Barber holds a PhD from the University of London. He has previously held posts at Sussex University, the University of Tokyo, the Berlin University of the Arts, the Sainsbury Centre for Visual Arts, the Keio University Research Centre for Art in Tokyo, and the California Institute of the Arts, where he was a Visiting Professor in 2007-8. He has been a Professor since 2002.